Watch out Craigslist, Sister Site Kijiji Is Taking Off. It’s not yet a Craigslist killer, but eBay’s free classifieds site Kijiji is taking off in the U.S. eBay, of course, is also an investor in Craigslist, but its 25 percent stake doesn’t give it a controlling interest and the other 75 percent is not for sale. So in March, 2005, eBay launched Kijiji as its own competing free classifieds site overseas. Then last summer, it launched a U.S. version of the site. Since then, the U.S. site alone has grown from 362,000 visitors in July, 2007 to 1.8 million in January, according to comScore. (If you count U.S. visits to Kijiji’s international sites as well, the number is 2.3 million). In comparison, Microsoft’s classified site, Windows Live Expo, attracted only 176,000 visitors in January, Yahoo Classifieds attracted 97,000, and neither Google’s classifieds site nor Google Base even registers on comScore. 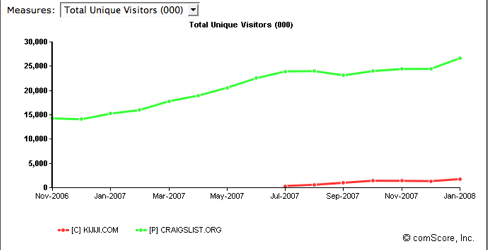 Kijiji’s visitor stats are still less than 10 percent of the 26.7 million people in the U.S. who went to Craigslist in January, but comScore puts Kijiji as the sixth most visited classifieds site in the U.S. (after Craigslist, sites owned by Dominion Enterprises like Homes.com, AutoTrader, Cars.com, and Apartments.com). Kijiji is ahead of classifieds sites like Oodle (No. 9, with 1.3 million U.S. visitors in January) and Vast (No. 20, with 444,000). eBay is obviously doing something right with Kijiji. But can it ever catch up to Craigslist?